St Francis Bay’s Crystal Hulett surfed her way to victory in the World Surf League Women’s’ Longboard event at the Royal St Andrews Hotel Port Alfred Classic Yesterday , 7 April. And another St Francis Bay surfer, Michael Hill, will be surfing against Steven Sawyer of Jeffreys Bay today in the first of the semis on Sunday. Both women caught plenty of waves in the final with Hulett’s top two scores totaling 11.25 out of 20 versus the 9.50 accumulated by Myers, giving Hulett the early lead in the WSL Africa women’s longboard rankings. The stage is set for a stirring finale to the Classic event presented by Quiksilver today after an excellent day of high performance surfing in a rising swell and light winds at East Beach in Port Alfred . The men’s longboard event resumes this morning with the man-on-man semi-finals which will feature three of the top four seeds. Former WSL No. 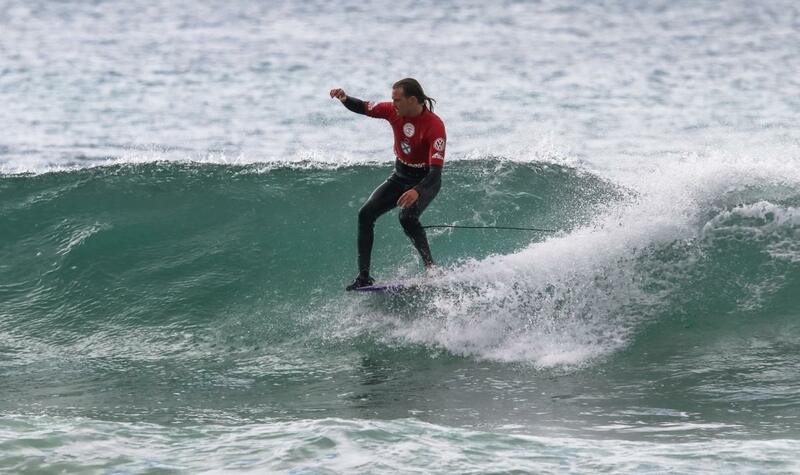 2 ranked longboarder Steven Sawyer showed no ill-effects from his foot injury as he powered to a huge quarter-final win over Sam Christianson in the reeling 1.0 to 1.3 metre waves in the mouth of the Kowie River. Surf writer, Craig Jarvis, says former WSL No. 2 ranked longboard rider Steven Sawyer is the favourite for the inaugural QS1,000 men’s longboard title at this contest. He put on a stellar performance in his Quarterfinal but was outpointed by the polished Ryan Lightfoot, also from J-Bay. Still his result will see him through to the Semifinals. Veteran Matthew Moir, 42, will be up against fellow Capetonian Thomas King in the second after they overcame the challenges of Alfonzo Pieters and Jonathan Hill respectively in their last eight clashes. Yesterday top seed and reigning WSL Africa champ Nicole Pallet (La Lucia) reached the semi-finals of the QS1,000 women’s event after outpointing Faye Zoetmulder (Cape St Francis) today Pallet’s clash with Argentinean Josefina Ane in the first semi should produce fireworks as both girls push for a place on the winner’s dais after finishing runner-up in their last events – Pallet in Port Elizabeth last Monday and Ane in Mar del Plata in her homeland the weekend before. Whoever prevails will meet the winner between internationally experienced Emma Smith (Jeffreys Bay) and 14-year-old Zoe Steyn (East London) in the final in Port Alfred. Steyn has posted several of the highest scores during the event, including an excellent 14.50 heat tally in her win over women’s longboard champ Crystal Hulett in their quarter-final duel this afternoon. The QS1,000 men’s event is down to the last eight who will match up in four man-on-man quarter-finals first thing on Sunday morning. Top seeds Beyrick de Vries (uMhlanga) and Matt McGillivray (Jeffreys Bay) have been eliminated and the remaining contenders are a mix of established stars, talented youngsters and Australian dark-horse Jordan Lawler. Experienced QS campaigner Slade Prestwich (Durban) meets rising Cape Town teenager Jordy Maree in the first clash followed by Matt Pallet (La Lucia) against Jeffreys Bay standout Dylan Lightfoot. The bottom half of the draw sees veteran former WSL Championship Tour campaigner and ISA Masters world champion Greg Emslie (East London) take on the inform David van Zyl (Glenashley), winner of the QS1,500 event in PE last week. The winner of that faces whoever emerges triumphant from the encounter between lanky Kommetjie junior Max Elkington and Australian Lawler. With bragging rights, a total of more than R70,000 in prize money, precious points on both the international and local rankings at stake and the waves predicted to be overhead, the final day of the inaugural Royal St Andrews Hotel Port Alfred Classic pres. by Quiksilver is set to be a cracker. The event also hosts activities designed to foster and encourage surfing among young people, regardless of their background. These are coordinated by Surfing South Africa, the national controlling body for the sport, and run by SSA Development Officer, Danielle Powis. Organisers meet at East Beach at 7.30 am local time on Sunday to make a call on when to get the contest underway. An 8 am start is anticipated.